Zone Base: I just hope my theater has Bumblebee cups! I just hope my theater has Bumblebee cups! I've got my tickets for Bumblebee reserved for an early Sunday afternoon showing, and I'm super excited. Really looking forward to seeing what looks like a great Transformers movie. 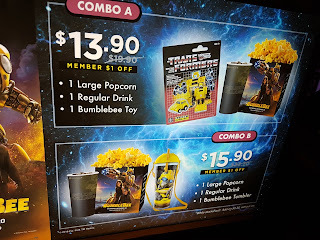 I'm also looking forward to getting the collectors cup and popcorn bucket (assuming my theater has them), as I usually do that. Then this past weekend I see news that in Singapore theaters not only have Bumblebee swag, but also selling a Bumblebee reissue in combos! Dude! Sure, it's the same Bumblebee that's (finally) appearing at my local Walmart stores, but there's a certain something about getting one at the theater! I'd totally be up for something like that. Imagine if it was some sort of exclusive version. Like instead of the 2004 face the current Walmart Bumblebee has, it had the original head or maybe a sparkly plastic. Even a 'theater edition' sticker on the package or something. Sure, it's be next to impossible to get one then (because they'd sell out in less than a second), but that's just cool.